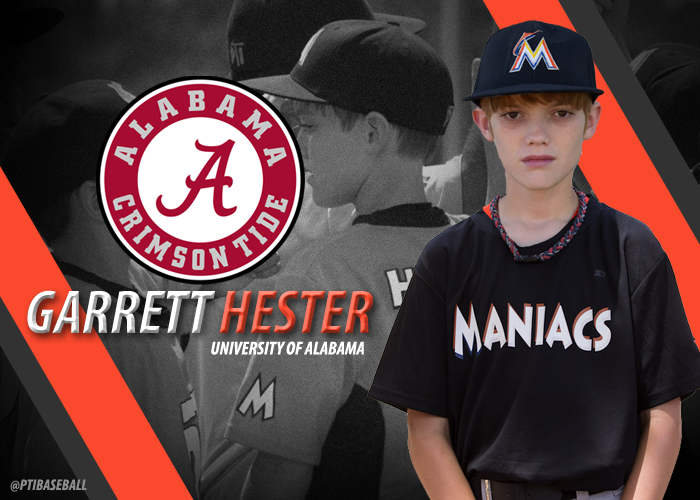 TAMPA, FL – Pro Talent Instructs is proud to announce the commitment of Garrett Hester to the University of Alabama on a baseball scholarship. Garrett spent many years playing for coach Jerry Gonzalez in the PTI Baseball program and served as a first baseman and left handed pitcher. Hester is one of the Organizations leader in strikeouts as he was lights out in most of his starts with the PTI organization. He was there when PTI had red colors and and he was there when they changed to orange colors. Hester joins the PTI Alumni Hall of Fame as another one of the Players advancing to play baseball at the next level. On Behalf of the entire Pro Talent Instructs staff, we want to congratulate Garrett on his accomplishment and we look forward to his continued success in the sport of baseball.